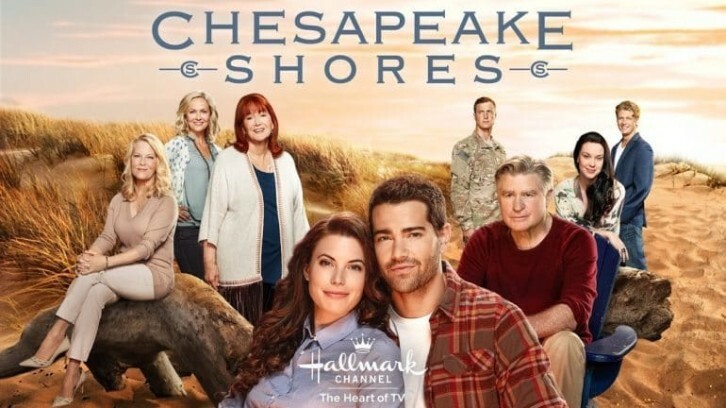 PASADENA, CA - February 9, 2019 - Hallmark Channel announces it has renewed the network's hit, original series "Chesapeake Shores" for a fourth season. Airing on Sunday nights at 9 p.m. ET/PT, "Chesapeake Shores" was one of Hallmark Channel's most-watched original series and joins the network's other primetime scripted shows as a top five-rated series on Sunday nights. Production on six episodes for season four is scheduled to commence this year for a season four premiere Summer 2019. The announcement was made today as part of Crown Media Family Networks' bi-annual Television Critics Association Winter Press Tour. "Viewers have found a home in their hearts for 'Chesapeake Shores' and have consistently made it a top performing show year-after-year," said Michelle Vicary, Executive Vice President, Programming and Network Publicity, Crown Media Family Networks. "We look forward to further exploring the show's heartfelt and compelling storylines as characters navigate the complexities of life and love," Vicary concluded. Based on the novels of the same name by New York Times bestselling author Sherryl Woods, the series stars Jesse Metcalfe ("Dallas"), Meghan Ory ("Once Upon a Time"), Golden Globe(R) nominee Treat Williams ("Everwood," Hair), Academy Award(R) nominee Diane Ladd (Wild at Heart), Barbara Niven ("Debbie Macomber's Cedar Cove"), Laci J. Mailey ("Falling Skies"), Emilie Ullerup ("Sanctuary"), Brendan Penny ("Motive") and Andrew Francis ("Final Destination 3"). The multi-generational family drama "Chesapeake Shores" follows Abby O'Brien (Ory), a high-powered career woman, divorcee and mother to two daughters, as she adjusts to life back in her hometown of Chesapeake Shores. Abby now balances a budding relationship with her former high school sweetheart, Trace (Metcalfe), working for a firm that does business with her uncompromising father Mick (Williams) and raising her children. Returning to her hometown means engaging in the lives of her siblings: Jess (Mailey) a free-spirit trying to succeed as a bed and breakfast owner; Bree (Ullerup), a playwright who buys a bookstore in Chesapeake Shores after moving back home from Chicago; Kevin (Penny), a soldier adjusting to civilian life and new romance; and Connor (Francis), a new lawyer establishing his professional career. Having returned to Chesapeake Shores shortly after Abby, the O'Brien's once-estranged mother Megan (Niven) strives to reestablish relationships with Abby and her siblings, though the O'Brien clan primarily looks to its wise grandmother Nell (Ladd) for guidance. "Chesapeake Shores" is a Daniel L. Paulson Production. Dan Paulson, Michael Berns, Nancey Silvers and Sherryl Woods are executive producers. Matt Drake serves as producer. Meghan Ory, Emilie Ullerup and Laci Mailey to Star in Spin-off Based on Characters From "Chesapeake Shores"
PASADENA, CA - February 9, 2019 - Hallmark Channel announces it has greenlit a spin-off movie based on characters from its original series "Chesapeake Shores." The world of "Chesapeake Shores" will expand into the movie genre with more stories from the O'Brien sisters, Abby, Bree and Jess, played by Meghan Ory, Emilie Ullerup and Laci Mailey, respectively. The announcement was made today as part of Crown Media Family Networks' bi-annual Television Critics Association Winter Press Tour. "Our viewers have fallen in love with the O'Brien sisters, characters filled with pure joy, humor and heart," said Michelle Vicary, Executive Vice President, Programming and Network Publicity, Crown Media Family Networks. "We are excited to dive deeper into their roles and shed more light on each of their journeys as these women balance romance, friendship, and family." The movie is based on characters from the novels Chesapeake Shores by New York Times bestselling author Sherryl Woods. Meghan Ory, Emilie Ullerup and Laci Mailey will reprise their roles of Abby O'Brien, Bree O'Brien and Jess O'Brien. With the winter weather dreary in Chesapeake Shores and their own love lives in a complicated state, Abby (Ory), Bree (Ullerup) and Jess (Mailey), adventure to Rome for the wedding of a childhood friend. While in Rome, they discover the wedding plans are in complete chaos and the bride may have a case of pre-wedding jitters because she has gone missing. In an attempt to find the bride, the O'Brien sisters scour the sites of Rome and work to create a happily ever after, while ultimately realizing the romance they each deserve back home in Chesapeake Shores.